Properties in Indian Harbour Beach average 4.7 out of 5 stars. Oceanfront Condo--View Ocean-Beach-Pool From Private Balcony! Property 2: Oceanfront Condo--View Ocean-Beach-Pool From Private Balcony! 4 BEDROOM HOUSE JUST A WALK TO THE BEACH! Property 4: 4 BEDROOM HOUSE JUST A WALK TO THE BEACH! Property 6: Feel like you are on the balcony of a cruise ship. Rent NOW for summer and fall! BREATH TAKING VIEWS of the Atlantic Ocean and Rocket Launches from sixth floor. Property 8: BREATH TAKING VIEWS of the Atlantic Ocean and Rocket Launches from sixth floor. Beachside Bliss!! 4 Bedroom Home with private fenced backyard! Property 12: Beachside Bliss!! 4 Bedroom Home with private fenced backyard! *** Tiled Ground Floor- Pond View- Walking distance to beach. !!Specials!!! Property 14: *** Tiled Ground Floor- Pond View- Walking distance to beach. !!Specials!!! Ocean front, gorgeous sunrises, beautiful beach- book now for late summer! Property 16: Ocean front, gorgeous sunrises, beautiful beach- book now for late summer! Beachfront Vacation Rental, Beautiful Views from the 1st story. Property 19: Beachfront Vacation Rental, Beautiful Views from the 1st story. Property 20: Beachfront Vacation Rental, W/ updated kitchen. Awesome Views! Beachfront Vacation Rental, Beautiful view from the 2nd story balcony. Property 22: Beachfront Vacation Rental, Beautiful view from the 2nd story balcony. Beachfront Vacation Rental, Beautiful Views from the 5th story balcony. Property 23: Beachfront Vacation Rental, Beautiful Views from the 5th story balcony. Beachfront Vacation Rental, Beautiful Views from the 3rd story balcony. Property 25: Beachfront Vacation Rental, Beautiful Views from the 3rd story balcony. Property 27: Beachfront Vacation Rental, Well Maintained & Decorated, Steps To The Beach. Beachfront Vacation Rental, Beautiful Views from the 2nd story balcony. Property 28: Beachfront Vacation Rental, Beautiful Views from the 2nd story balcony. Property 30: Beachfront Vacation Rental, Beautiful view from the 2nd story balcony. Property 31: Beachfront Vacation Rental, Beautiful Views from the 6th story balcony. Property 32: Beachfront Vacation Rental, Beautiful Views from the 2nd story balcony. Property 34: Beachfront Vacation Rental, Beautiful Views from the 6th story balcony. Beautiful remodeled ocean front condo. Enjoy a warm Florida winter at the beach! Property 35: Beautiful remodeled ocean front condo. Enjoy a warm Florida winter at the beach! Property 40: NEW! Indian Harbour Beach Home - Walk to Beach! Sunny home w/ private yard, patio & firepit - 3 blocks to the white sand beach! Property 43: Sunny home w/ private yard, patio & firepit - 3 blocks to the white sand beach! Property 44: Great 2nd floor house apt. Beach is across road. Pool. Ocean breeze & sunrise. 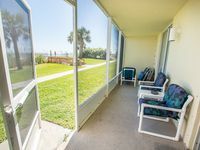 Ocean Front Complex -Beautiful Panoramic Views of the Ocean! Property 49: Ocean Front Complex -Beautiful Panoramic Views of the Ocean! Direct Oceanfront Condo, beautifully furnished and just steps to the beach! Property 50: Direct Oceanfront Condo, beautifully furnished and just steps to the beach! Great location on a beautiful beach , clean with everything you need. Would definitely stay again.